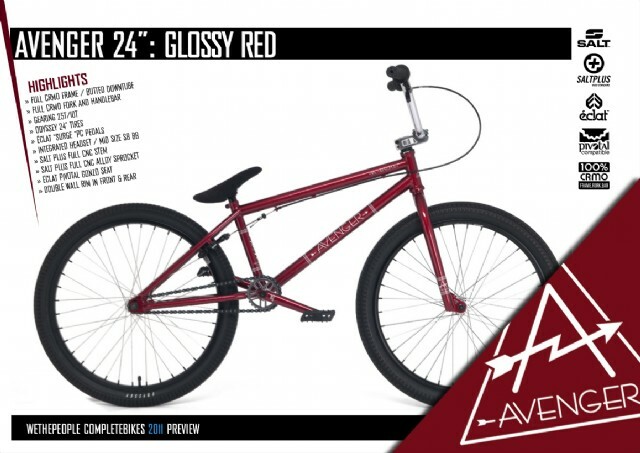 We The People is back for 2011 with an update to the Avenger 24″. It was called the Avenue in previous years but it had a mid-season name change in 2010 to the Avenger. Right of the bat, you’ll notice the look has changed to a cleaner glossy-red finish, right down to the cranks (a nice touch) with stripped-down graphics that are a bit on the basic, ho-hum side. Notables include a new top-loading stem, 7″ bars, Odyssey tires, and double-wall rims. However, a bit of a disappointment is the 21.25″ top tube/15.23″ chain stay dimensions. I would have really liked to have seen a longer top-tube and a slightly tighter chain stay length. All in all though, if you can get past the shorter top-tube, this is looks like it could be one of the better completes out there for the new year. My apologies for the blurry picture. It was the best I could find at the current time. I will link to a better image once it becomes available. Update: We The People has posted an online version of their 2011 catalog. John Beck sent me a note a while back regarding something he’s been experimenting with. 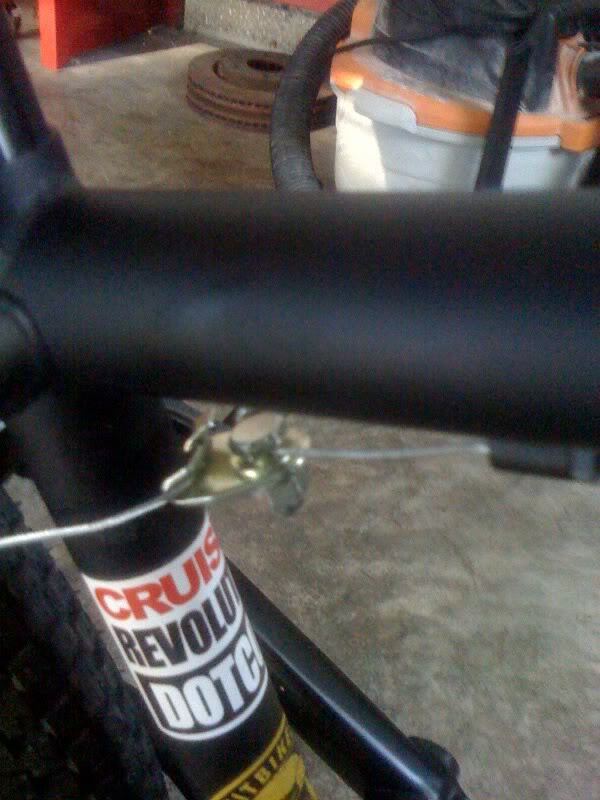 While working on a custom steel project for his “day gig” he came across a solution to the often frustrating task of dialing-in brakes when dealing with a cable hanger. His solution? An elegant design that requires no tools and only one hand to adjust. The cable enters (from the lever) into the knurled top, and exits at the bottom. Once the cable is inserted, it is “gripped” internally and can hold a serious amount of weight. Tighten the knurled piece and it locks in tight. To loosen or remove you just undo the knurled piece, push it in and the cable is released. The short cable at the brake enters through the sides, similar to the typical design. John’s still testing the idea out but if this holds up it could become a very cool upgrade. Is the Liquid Feedback the go-to 24″ for trails this year? Erik Hortsch puts his new Liquid through its paces in this Vimeo video edit. Summer’s here and people are showing more skin. Your bike should be no different. Ready to take the plunge and rock the skinwall tire? A good option might be the DMR Supermoto, available in wire and kevlar. 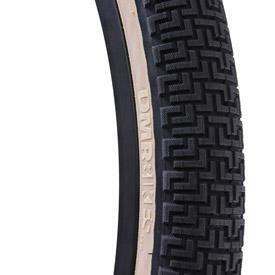 Technically a MTB dirt jumping tire, it seems like it would be a great option for a 24″ BMX. 2.1 inches wide with a low profile it would be at home at skateparks, trails and race tracks. It’s relatively lightweight too. Not sure how widely available this tire is in North America (DMR is based out of the UK) but their site shows both U.S. and Canada distribution so you should be able to get it if your bike shop deals with one of the listed distributors. For more on my one-man crusade to bring back the skinwall tire, check out Is it time to show some skin again? and Showing some skin in Utah. Update: The 24″ version of this tire is available in wire only. The 26″ version is available in both wire and kevlar. 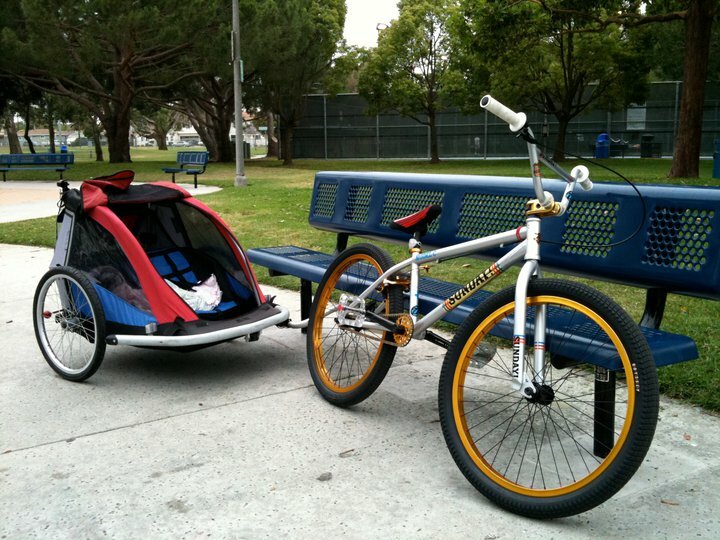 Looks like there might be more kids traveling in style. 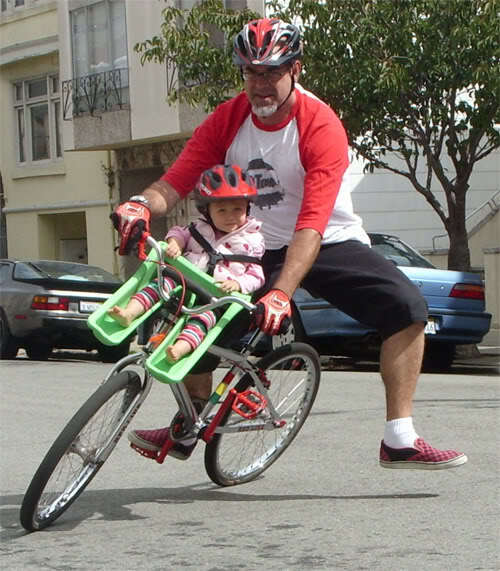 Check out Matt Shelley on a classic Redline cruiser with his daughter riding co-pilot. First comes love, then comes marriage, then comes….a tricked-out Sunday Model-C towing a baby carriage? Yes, apparently in this case it does. Ron Plumlee shows us how a modern dad travels with his kid. I have been checking out Edward Koenning‘s blog, When are you going to get a real bike? for a little while now and I have to say I’m getting pretty hooked. 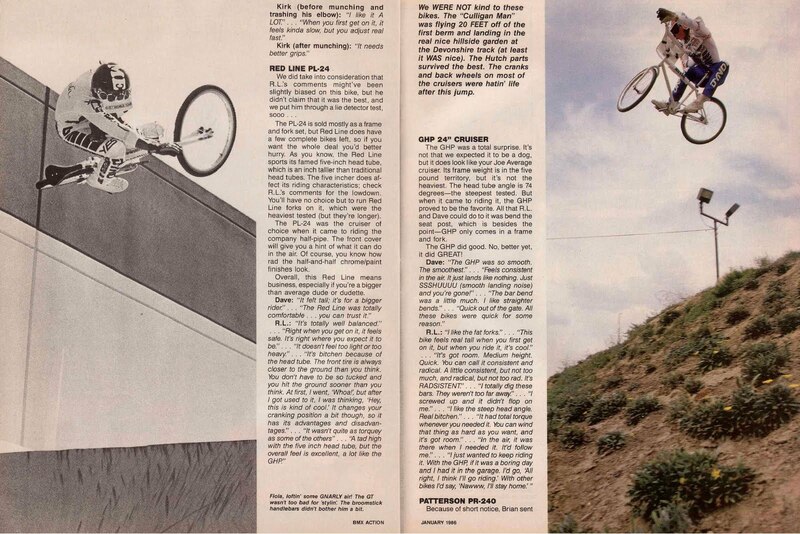 A big part of his blog is digging up vintage BMX magazine pictures/spreads and commenting on them. I often find myself tripping down memory lane when I read one of his posts. I start remembering where I was when I saw or read it, how I devoured every word of the mag (keep in mind this was before the Internet) and how much it had an influence on me. I was pretty stoked to see him pull out this gem recently. 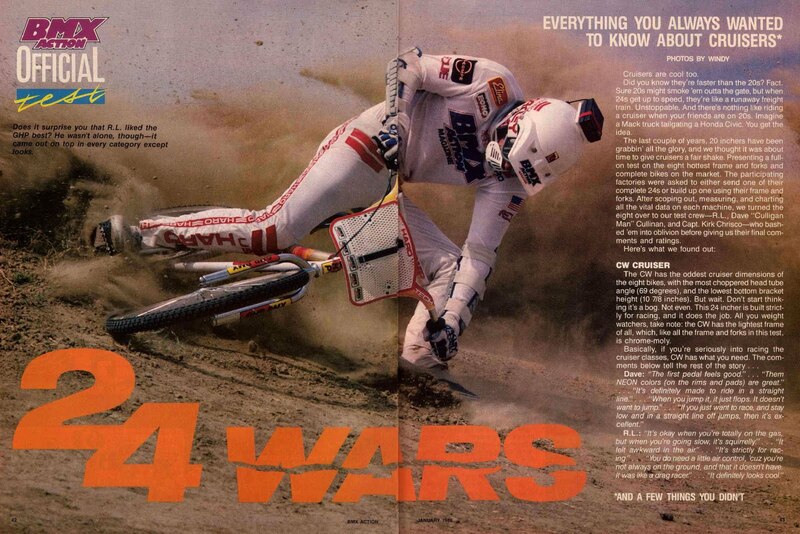 An awesome berm slide by RL Osborn from BMX Action‘s “24 Wars” cruiser shootout article. I was pretty stoked on this spread too. Eddie Fiola with a perfect table top air (on vert!) and “The Culligan Man” doing a big jump on a race cruiser to see how it would hold up. If you’ve been into BMX for a while, When are you going to get a real bike? is definitely worth checking out. Tags: 24 wars, BMX, BMX Action, BMX Cruiser, cruiser shootout, Culligan Man, Ed Koenning, Eddie Fiola, Edward Koenning, memory lane, RL Osborn, tabletop air, Vert, Vintage BMX magazines, When are you going to get a real bike?